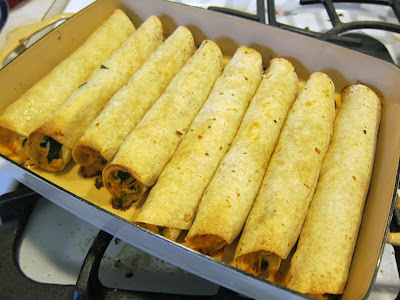 In my ongoing quest for quick and somewhat healthy dinner ideas, I came across a tasty recipe for chicken flautas today. Usually my decision to try a recipe is based 90 per cent on whether I have all of the ingredients already. This one passed the screening and sounded tasty as can be. Since I never know what type of vegetable to serve alongside Mexican food, I tweaked the recipe slightly and added chopped frozen spinach. I also healthified it more by adding a wild rice/quinoa blend that I'd made earlier in the day and saved in the fridge. Both boys (husband and son) gobbled this up. I think I'll have to make these a staple dinner in our house. Preheat oven to 400 degrees. Spray a casserole dish with cooking spray and set aside. Place frozen spinach in a microwave-safe bowl and cover with water. Cover bowl with plastic wrap and microwave for two minutes. Drain thoroughly, squeezing with your hands to remove as much water as possible. Place in a medium mixing bowl. Butterfly the chicken breast and coat both sides with salt and pepper. Coat a frying pan with olive oil and heat over medium-high flame. Add chicken and brown on both sides, about 5 minutes per side. Once chicken is thoroughly cooked, shred with two forks and add to mixing bowl. Add all the other ingredients but the tortillas and combine thoroughly. 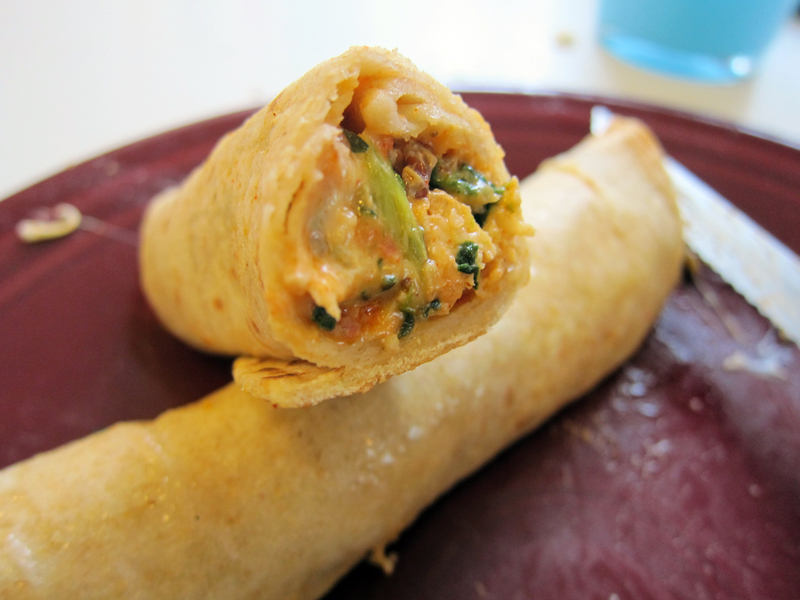 Spoon about 1/4 cup of the filling onto a tortilla and shape it into a narrow log. Roll up the tortilla tightly and place seam-side down in a casserole dish. Do the same with the rest of the tortillas and coat the tops of the taquitos with cooking spray. Bake in the oven for 15 minutes or until they are golden and crisp on the edges.